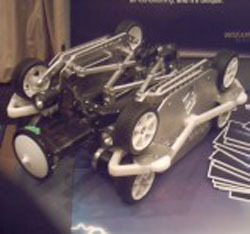 The Wizard, a remote-operated duct-inspecting robot, has won the the Best Engineering Award in Britain in the Knowledge Transfer Partnership 2007 awards. Designed by Breval, a Glasgow-based company, the robot works inside ventilation sytems - just like their remote grandchildren, the robotic Sentinels of the Matrix movies. The Wizard robot has eight wheels, lights and cameras. "We feel sure that the investment we have made in this direction will in the near future offer many of our existing and new clients a probable solution to ventilation ductwork problems, be they bacterial contamination, refurbishment or poor efficiency, this could be the answer" said Patrick McBride, contracts director of Breval. When I saw this little guy, I naturally thought about alien robotic organisms inside the walls, having written a story last week about Unwanted Life Forms Abound In Sick Spacecraft, in which micro-organisms were found to flourish inside the walls of the Mir space station. The Wizard robots are the remote ancestors of the duct-diving robotic Sentinels of the Matrix movies. In the movies, the Sentinels restlessly search the ductwork underlying the Matrix infrastructure, searching for unwanted elements skulking therein (Keanu Reeves, Laurence Fishburne, Carrie-Anne Moss, et al). Snake-arm robots are going places they had never been before. The first untethered robot used to inspect underground natural gas distribution pipelines. A successful cable inspection robot must overcome many obstacles. From Wizard the AC robot works magic on judges via Robot Gossip.